Hourly door prizes* including ARRL store gift certificates, ending at 12 noon with the $200 cash Grand Prize drawing+. Vendors and flea market (tailgate) will be set up inside the main building with outside on the parking lot as the sellers option. There will be lots of "treasures" for you to purchase. Breakfast and lunch items will be available at the food court inside the main building Doors open to the public at 8 am on Saturday. 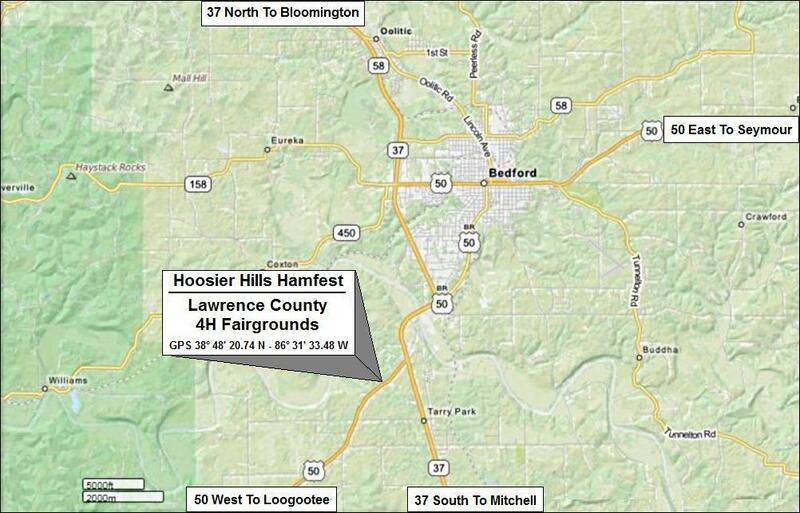 You really don't want to miss the 57th Annual Hoosier Hills Hamfest!!! *NOTE: Main entrance and ticket sales to the hamfest is located inside the south door, next to the overhead garage door. We will be selling all admission tickets at the south entry door next to the overhead garage door. Admission for everyone 12 years and older is five dollars ($5), children under 12 are FREE with a paid adult. All tickets sold and placed in the "cage" are eligable for hourly door prizes and the $200 Hoosier Hills Hamfest Grand Prize. Exhibitors inside the main building, will be supplied 1 table for each 10 ft x 10 ft space and the price is just $10 per space (Plus admission) and will be allocated on a first come first serve basis. Discounts available for quantity space rental. Inside Flea Market spaces are $5 each if you supply your own table. (A Table Is Required for each space) Spaces can be reserved in advance by contacting the club's hamfest contact person, W.W. - KB9TMP. Power is available, but you will need to supply any extension cords. A drawing of the main building exhibit hall and map of the fairgrounds is available below. Vendors and those tailgate flea market, will have access to the fairgrounds Friday evening from 4:30 to 6 pm, plus Saturday morning at 6am for setup. All vendor/tailgate fees will be collected at your assigned booth. Admission to be paid for at the south entrance. ARRL VE testing will be offered to those interested. Test registration will begin at 9:30 am local time and testing will begin at 10am. Test fee is $15 and you will need to bring a "PHOTO" ID to test. If you're planning on upgrading, please bring a photocopy of your current license also. The hamfest will go on RAIN OR SHINE! Link will open in new window. Picture from 2005. Want to reserve a booth & table? * One door prize or gift certificiate per hour per person. Must be present to win hourly door prizes. All unclaimed door prizes will be awarded prior to the Grand Prize drawing. + Winner need not be present for the Grand Prize drawing at 12 noon. Lawrence County 4H Fairgound's Rules do not allow pets inside the buildings. Service animals are exempt. 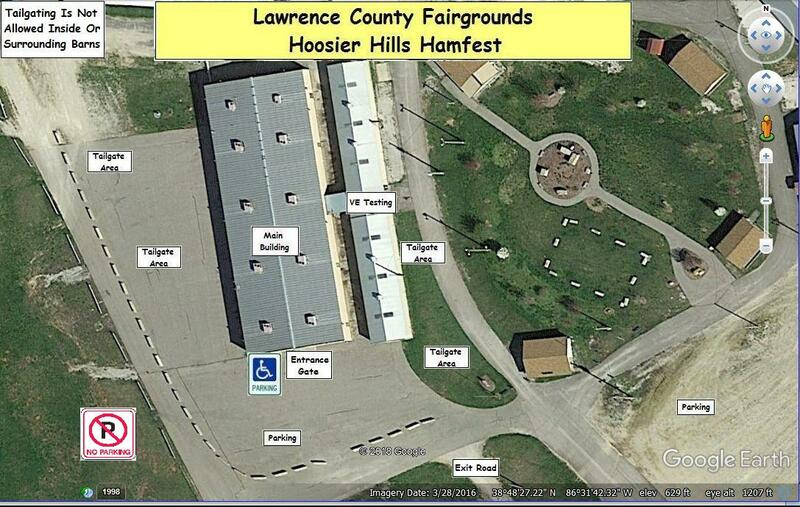 The Hoosier Hills Ham Club & Hamfest are not responsible for accidents on Lawrence Co. 4H Fairground property.